Operating frequency 19 kHz. 17.8 kHz. Gold bug dp loves nickels. I live and Indiana and purchase my Gold Bug DP 8 month ago. I bought the machine specifically to coin hunt and hunt for micro jewelry. After many hours using this machine I would like to share my view point with you. I own many different detectors and over 20 years experience to base my opinion on. The 1st trip out: I was eager to try the machine and saved a few good places to use it on when the weather cleared. I also had in mind a few detectors I owned and wanted to try it against. After 1 hour using the machine, I hated the machine, I liked the weight, but I thought the machine was a mistake because of all the problems I was having finding good targets. I switched machines, went back over what I had already hunted and found a few good coins. The next several hunts also ended with me hating the machine and I contemplated sending the unit back. The Turning point: About the 5th hunt I started finding a few coins, but I was still having some confusion on the tones and the erratic readings I was experiencing on the display. The light was fading fast and I was forced to finish out the hunt in the dark. 3 hours after light had passed I finally figured out my problems and I began to dig the good finds with little junk! What happened? I was forced to hunt by tone and not reading the numerical display. The tone qualities on this machine are amazing. I am now able to pretty accurately guess what I am going to dig. The machine is sensitive to EMI buried lines etc. Keep your sensitivity low for your 1st set of batteries are used up, then your learning curve will be shorter then mine. Last week I went to my back yard and hunted a 13'x26' area, I have hunted this with my Minelab, Tesoro, Fisher CZ models and a Garret. Now the results were a little concerning, I found way to much stuff! 8 old pennies and a nickel. Most these were dug at 4" to 6" depth. What happened? Not sure at this point but I had a hunch. Proving Grounds: I went to a elementary school that is located about a 100 yards from my house. Last few weeks I searched an area that was 40'x120' with a Fisher CZ-3D and I found a few coins. This Trip I ground balance the machine made 3 steps and Ding! Good target 4" down, reading 57 and 58. Yup a nickel! After 1/2 a day in this area I dug out 2 quarters, 10 Dimes, 12 nickels and 19 pennies only three were at the surface. Now I am upset...Why did my other detectors not find these coins??? Truthfully...Who cares! This detector is my newest it should out perform my others. My Summary: This Detector has Several Key points I liked. 1-This Detector is Hot on Nickels! Smokes all my detectors. 2-Finds the coins in trash better then all my other detectors. 3-Love the weight! Easy to swing. 5-Good Dollar value based on performance. 6-Great Owners Manual. Read it 3 times!!!! 1-No volume control. Use Premium Head Phones...A must!!! 4-Finds small items that you do not want while coin hunting! You will figure it out! 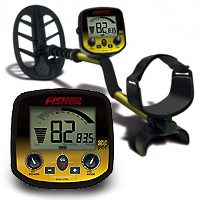 The detector was used with the stock coil, I liked using it on the large open ball parks and soccer fields. It did good in school grounds and homesteads. I have yet to hit any woods, but I am pleased with the performance now that I understand all the tones and noises it makes. One time I dug out a dime with a pull tab above it and a nail next to it. Swing speed is what ever you want, fast or slow. I had the best luck coin shooting with the discrimination set on 40 and most items I dug were good. Study the chart in owners manual it tells you with good accuracy what the numerical readout is on coins. Dig everything your 1st week and learn what the chirps, bleeps, beeps and screamers are. By the end of the week you will know the tones. After you master the tones then you can work on reading the numbers. 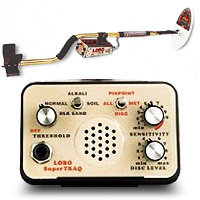 If I had this detector stolen today, I would order another one immediately. I am ordering the 5" coil for it this week and going to try my luck in a real trashy areas. Small jewelry tested well, but so far I have only found 1 ring with it. Now I am faced with the decision of what to do with my detectors that do not live up to this level of performance! Hello e-bay! Best all around coin, relic, machine I have ever owned. No nuggets yet, or at least not gold ones, found a couple pounds of lead/galena nuggets up in Wisconsin, at least 50 pieces of gold and silver jewelry, several chains, and over 500 bucks in clad and pennies. Best all around coil is the 9x8, pinpoints extremely well and detector has VCO pinpoint and auto ground tracking in all metal mode. THe only misgivings I have with it are that it hates water. I have had to return it 4 times now for retuning and they always accuse me of water damage. I bought a Headhunter Diver last year and it is the best for ring hunting in water. The LST is a keeper. I have 4 coils for mine, hope to use the new Tejon 10x12 coil with it when it comes back from retuning. I always get my LST tuned to the 9x8 coil in disc mode for max depth, like a foot on gold rings. This is the only detector I have ever owned that will go deeper on gold jewelry, by 3-4 inches, than on, say a silver quarter, about 8 inch on the quarter and 12 inch on a heavy gold ring, AFTER the retune. It comes stock with a 5 x 10 elliptical which is harder to pinpoint with. Gimme that 9x8 anyday. I guess the 5x10 is what is preferred for nugget hunting but I still say the 9x8 is the best coil for this unit.